As part of a larger marketing effort to align LIONarchitecture’s primary interest: architecture and space habitation, we have recently completed a design for long-term base on the Martian surface. Designed as part of a four-person collaborative, the project stems from a possible future Mars habitation. As part of a larger colonization effort by world space agencies and companies like SpaceX and Blue Origins, our proposal, known as M.A.R.S. [Manufacturing And Research System], is a fully functional architecture that inherently produces its own means of existence. 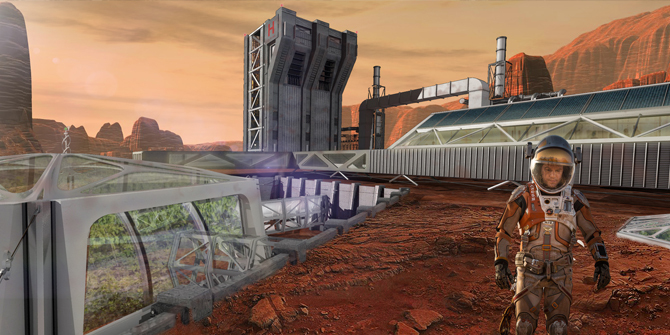 Not intended as the first base camp on Mars, which will likely be a temporary lightweight structure brought from Earth, M.A.R.S. is a long-term strategic base for permanent colonization. • Space Exploration in reality is different than what is imagined. • M.A.R.S. is established 50 years after initial Mars human landing. • The facility will require botanists and geologists. • By its very nature, the facility must be self-producing, not merely self-sustaining. M.A.R.S. is a fully functional system that inherently produces its own means of existance. Drilling, mining, and production facilities on-site create the raw materials [iron / marscrete] to build the buildings. M.A.R.S., therefore, also provides habitation spaces for three botanists [vegetation production] and two geologists [mining]. With interplanetary travel for humans not a far-fetched idea and innovations made every day to make it a reality soon. It is now time to imagine and create a new civilization. A civilization the world has dreamed with an opportunity to design the future architectural prospect on the Red Planet for others to follow. The M.A.R.S. Project will continue to be developed over the upcoming years. Please stay tuned to our Work page for more information.